Lisa Stone, chief community officer of SheKnows Media and co-founder of BlogHer. 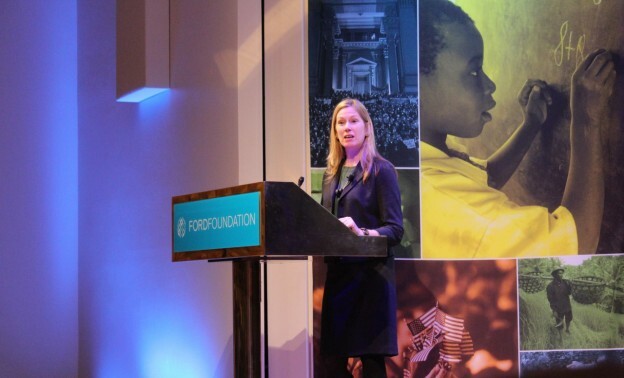 Journalists, entrepreneurs, “intrapreneurs,” funders, storytellers, academics and change agents gathered from locations across the globe at the Ford Foundation this past Thursday and Friday, ready to collaborate. 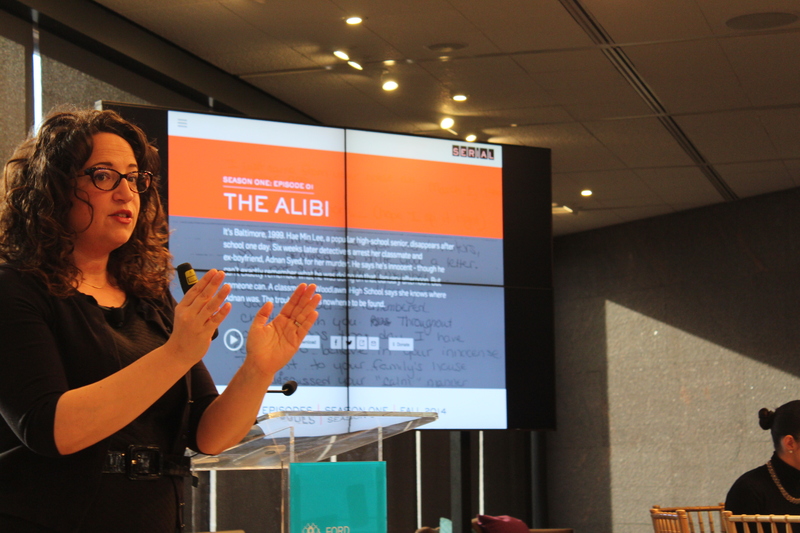 The Women Digital News Entrepreneurs Summit, “Cracking the Code,” produced by the International Women’s Media Foundation, was not your ordinary digital news event. The women who filled this space were ignited with powerful energy that transformed conversations into action. The panel on “Leading Digital Innovation in Established Media Organizations,” including (left to right) Amy O’Leary, Mandy Jenkins, Lakshmi Chaudhry, Youyoung Lee and Stacy-Marie Ishmael. Crack the Code. Break the Stereotype. During the breakfast panel, Mariana Santos addressed a big question: “Where are the women in digital news?” Santos founded Chicas Poderosas because she saw a need for Latin women in digital news. “Connecting mentors with people that are really eager to learn, but they don’t have access, they don’t have money to come to the U.S. for conferences like this, so I try to bring the conference to them … The women go back to their newsrooms and they feel more confident, they feel empowered. So, it’s not just about the technology tools and the process. It’s about the confidence,” she said. 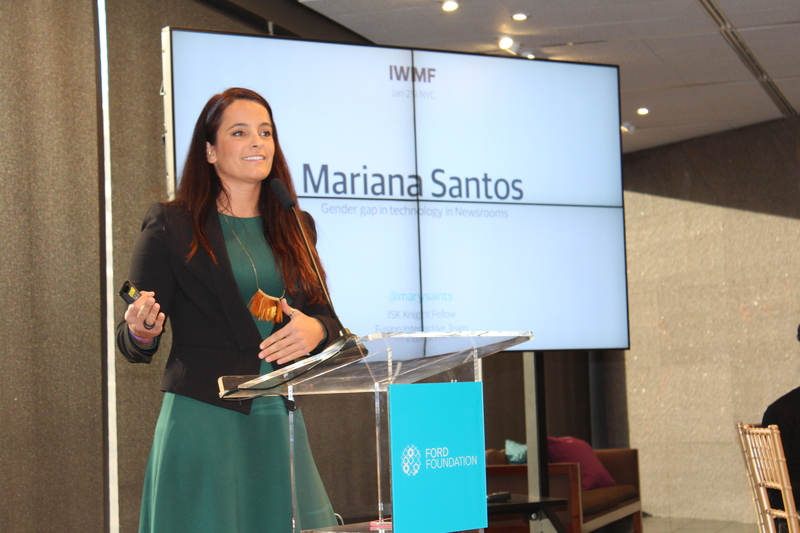 Santos believes women can break stereotypes by utilizing leadership, innovation, team spirit, mentoring and female networks. You can view her presentation here. Mariana Santos, founder of Chicas Poderosas and director of interactive and animation at Fusion. The publication she was working with at the time would not touch human rights issues nor would they touch any stories that spoke ill of companies or needed additional investigative work. “Meanwhile people wanted to see these stories and there were a bunch of journalists who really wanted to do these stories, but they didn’t have an outlet. So we put 15 volunteer journalists in a room and [decided to] dig through documents for a full weekend. [We wanted to] put out the stories for free and we did,” she said. Viana helped bring investigative journalism to Brazil with a new non-profit publication, proof that entrepreneurship and new ideas may be a key to women cracking the code. Publica also mentors and incubates new publications in Brazil and distributes grants to independent journalists. Know Your Audience. Consumer > Device. Amy Webb talks about trends to watch. She gave this example: If the consumer is driving, a longer audio version of the story may make sense. If the consumer is jogging, you could send a text alert, but you also have to consider if it is the first time they’re being introduced to the subject and what they’re thinking about at the time. “The phone knows all of these things about us. It can infer all of these things and you have access to this information,” she said. Many of the women suggested inviting the audience into the editorial process as a way to engage. Jennifer Brandel is founder and executive producer at Curious Nation, which grew out of the Curious City project at WBEZ. She explained how Curious City asked a question to the public as part of their pitch process. For their assignment process, they curate the pitches and allow the public to decide which questions are best. Then WBEZ investigates the chosen questions alongside the person who asked it, creating multimedia stories in the process. Plus, Curious City publishes via social media along the way to continue engagement. “The multiple entry points into the process give journalists value at every feedback point, and audience feedback creates new beats,” Brandel said. The project closes the distance between audience and reporter by bringing them together face-to-face, breaking down walls and making the journalist more of a service provider. Create Good Content. Move the Needle. So the question for journalists is: How do you write something they have to read? Lessin believes consumers will pay for good content. The Information is a subscription-based service and focuses on stories that their audience, professionals in tech and finance, have to read and aren’t getting elsewhere. “The definition of success for the news business should be set by the entrepreneurs, businesses and leaders in the news industry,” Lessin said. 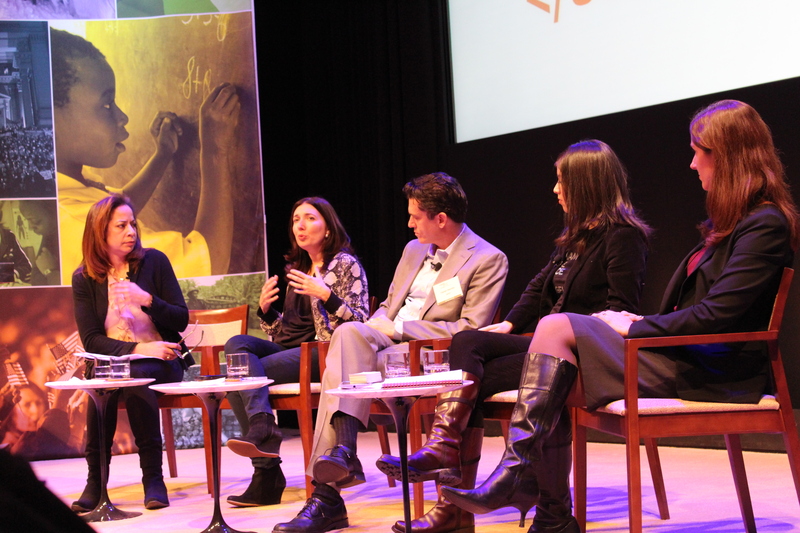 Publishers should measure success based on stories that create actionable intelligence and move the needle on social change — rather than just audience size and scale. “Scale doesn’t equal attention or impact. A small-engaged audience that’s listening is more important than more followers because impact is the desired result for news, not scale,” Webb said. “I think it goes back to editorial. I think it goes back to your soul and I think we need to keep that,” said Maria Ressa, CEO and executive editor of Rappler, a social news network where stories inspire community engagement and action for social change. The panel on “Where’s the Money for Digital News Entrepreneurs?” (left to right) Adaora Udoji, Fran Hauser, Harlan Mandel, Natalia Oberti Noguera and Stacy Donohue. Find all of the program speakers here. 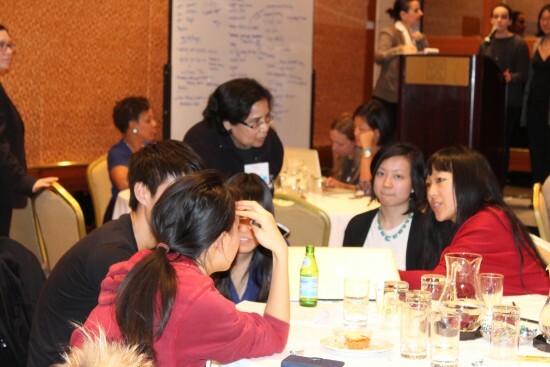 Women gather to brainstorm ideas at the hackathon. After the summit, Bloomberg News hosted a reception where there were more opportunities for networking followed by a late-night brainstorming session for Friday’s Hackathon. 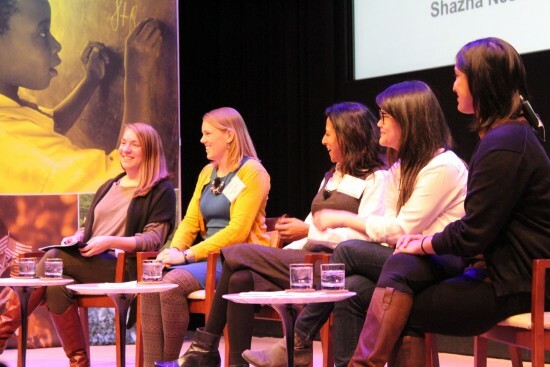 The day-long Hackathon was evidence of what women can do when collaborating. Journalists, coders, designers and entrepreneurs created groups and worked on web applications and apps that aimed to resolve big issues for women in news media. Judges included Jeremy Caplan, director of education for the Tow-Knight Center for Entrepreneurial Journalism at the CUNY Graduate School of Journalism; Latoya Drake, spokesperson and media/marketing manager at Google; Julian Moncada, analyst at Lerer Hippeau Ventures; Rosemary Okello Orlale, communication specialist and expert on media, gender and communication for development at the Ford Foundation; Chrys Wu, founding organizer of Hacks/Hackers; and Lisa Stone, SheKnows Media’s chief community officer and the co-founder of BlogHer. All of the participants worked tirelessly from 8 a.m. until 6 p.m. and presented dynamic presentations at the end. Each group received feedback from the judges before the winners were announced. The projects were judged on usefulness, creativity, user-friendliness and technical difficulty. Google awarded $10,000 in prize money for the winners. The winning teams included TrollBusters, an online service offering pest control for female news publishers created by Michelle Ferrier, Louisa Reynolds, Sneha Inguva, Debbie Galant and Berta Valle. PitchCoach, an app that teaches women digital media entrepreneurs how to pitch their ideas was another winning idea, created by Stephanie Lowe, Jessica Liu, Suhyun Kim and Jason Long. The third winner was The Gender Report, an online service that allows you to visualize the gender of the people reporting the news created by Patricia Zablah and Mimi Tam. An honorable mention went to LaunchMeet, a match-making app that helps women media entrepreneurs find a team for their startup company or project, created by Mindy McAdams, Cynthia Liu, DeShuna Spencer, Citra Prastuti, Fungai Machirori and Natalia Antelava. Other projects included: MentHer, an app that pairs young women with successful women in digital news as mentors; Juno, a website that empowers women to find the ideal workplace for their lifestyle; Inherently, a digital platform that allows forward thinkers to showcase their ideas anonymously; Impala, an app that connects women with the latest media jobs curated by experts in the industry; and Open Ripple, a news platform that allows organizations and businesses to track their impact. We left the event inspired and ready to get to work. Kimberly Selden works with the PBS MediaShift events team and is a freelance television and live event producer. Kimberly is also a social entrepreneur, starting her own non-profit that focuses on using media for social change with a concentration on developing countries suffering from the digital divide.